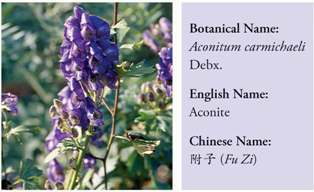 Aconite (Fu Zi) is a prepared product from the daughter roots of the Ranunculaceae Family plant Wu Tou (Aconitum carmichaeli Debx.). The main places of origin are Jiang-You County and An County in <?xml:namespace prefix = st1 ns = "urn:schemas-microsoft-com:office:smarttags" />Si-Chuan Province. It is usually harvested during late June to early August each year. The mother root, fibrous roots, and mud are all removed, so it used to be called “Mud Fu Zi”. Fu Zi is acrid, sweet, hot, and toxic; it enters the Heart, Kidney, and Spleen channels. The functions are to restore Yang and rescue from desertion, supplement fire and assist Yang, expel wind cold and interior pathogenic evils, etc. Fu Zi is toxic and should always be processed. It usually comes in processed forms such as salted Fu Zi, sliced white Fu Zi, sliced black Fu Zi. The levels of toxicity present within Fu Zi vary a lot due to various influences, such as the place of origin, harvesting, processing, and the decoction time. Whichever factors affect by Brion Research Institute of Taiwan the content level of alkaloids such as aconitine, would affect its level of toxicity. For example, there is a report showing the LD50 for cooked sliced Fu Zi decoction in mice is 17.4g/kg via oral administration and 3.52g/kg via intravenous injection. Another report shows that the LD50 in mice via abdominal injection is 26.3g/kg. The level of toxicity of Fu Zi after 40 minutes of processing at 120°C is 1/5-1/350 of raw Fu Zi, with a LD50 over 100g/kg via oral administration. Room temperatures, combinations, and the species of mice are also factors that affect the levels of toxicity. 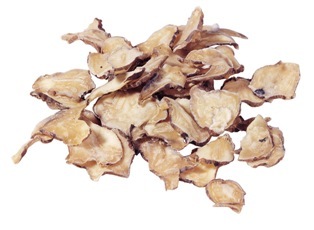 Processing has a clear effect on the toxicity and function of Fu Zi. When there is poisonous alkaloid like aconitine, the cardiac-stimulating function is inhibited. Raw Fu Zi doesn’t have a cardiac-stimulating function and at a slightly larger dosage will lead to arrhythmia and atrioventricular block. However, aconitine is not heat resistant and is mostly destroyed during the processing. Thus processed sliced Fu Zi and salted Fu Zi both have a notable cardiac-stimulating effect, but the analgesic effect is reduced. A large dosage might also lead to arrhythmia. The contents of alkaloids in sliced white Fu Zi and sliced black Fu Zi are very similar due to their similar processing methods. The total contents of alkaloids within the processed herb are 1/6-1/9 of the raw herbs, and the content of diterpene alkaloids are only 1/100 of the raw herbs. A slice of salted Fu Zi has similar total alkaloids contents due to milder processing conditions, but its diterpene alkaloids are higher. The toxicities of raw herbs should not be determined by the content of total alkaloids, but should be based on the level of diterpene alkaloids. Fu Zi decoctions, decoctions that are cooked for long time, and the water-soluble portion all have distinct cardiacstimulating effect on frogs, toads, and warm-blooded animals’ hearts, no matter if they are in a normal or failing state. The main cardiac stimulating components are dl-Demethylcodaurine (Higenamine), coryneine chloride, and Salsolinol. The longer decoction time will not reduce the contents of these cardiac stimulating components.